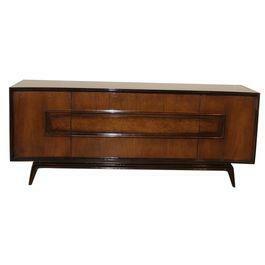 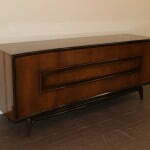 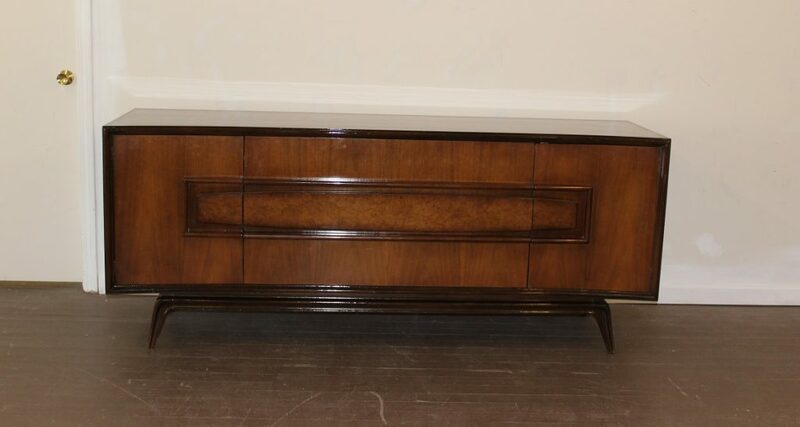 This beautiful credenza / dresser was manufactured by the Hoke Wood Products Company from Thurmont MD. 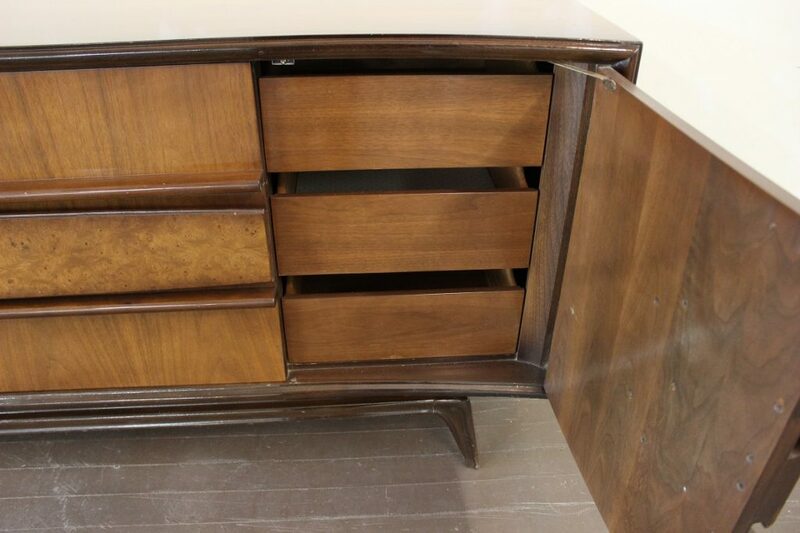 The front features 3 long drawers and 1 door on each side of them. 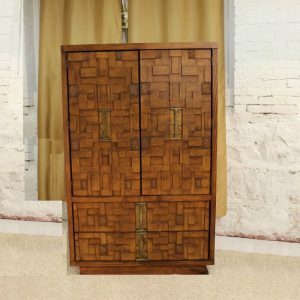 Each of these doors conceals 3 small drawers. 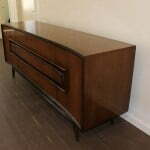 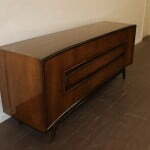 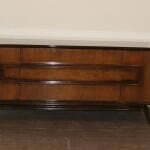 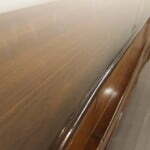 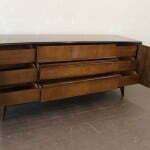 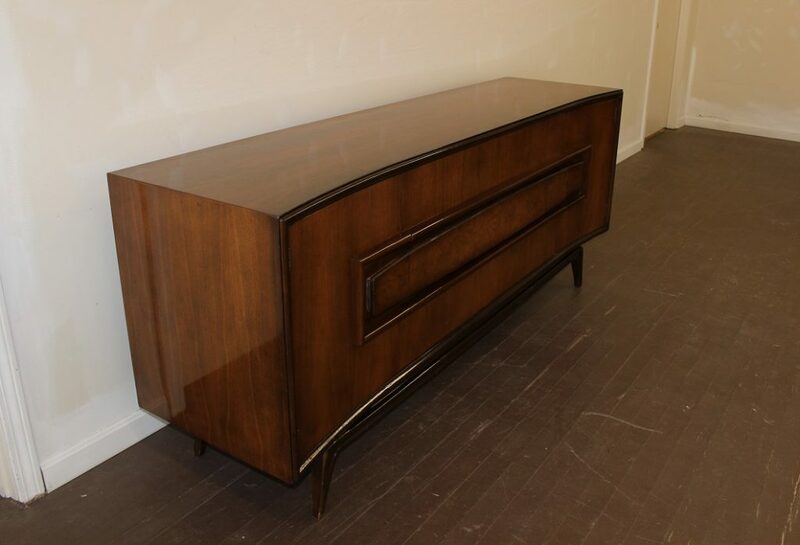 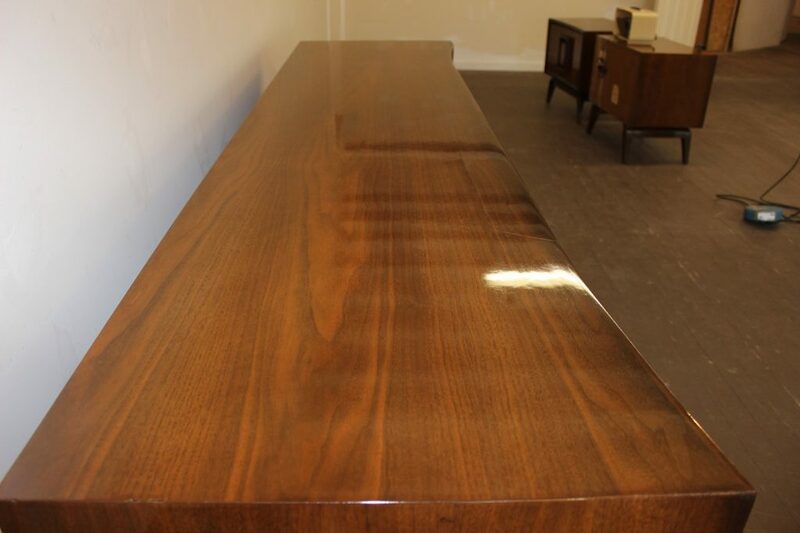 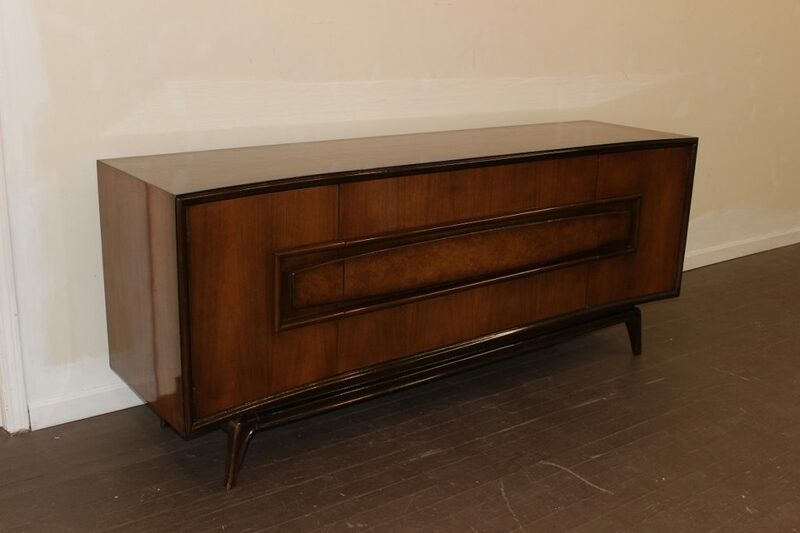 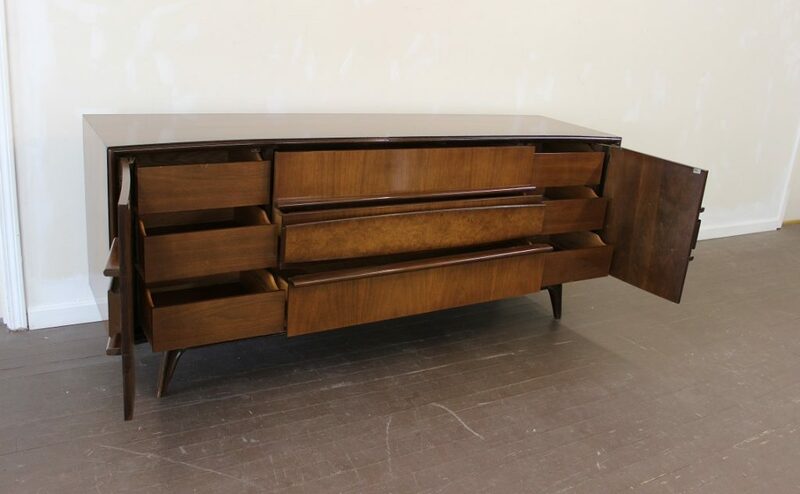 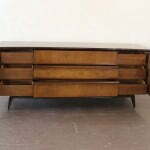 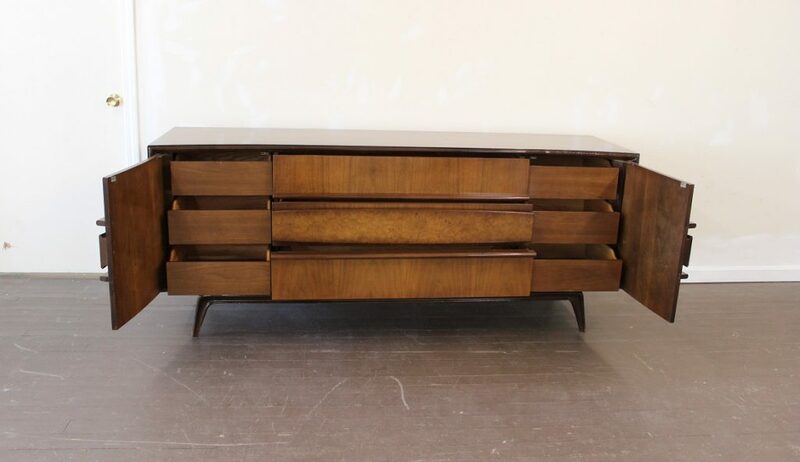 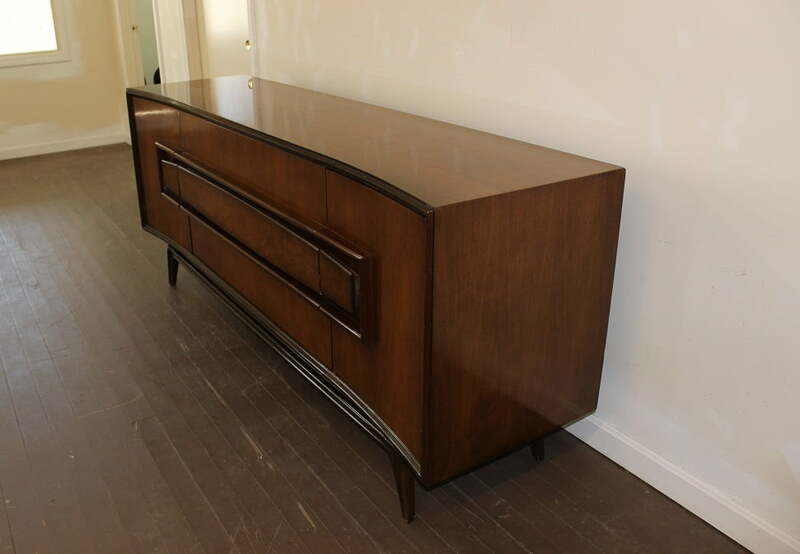 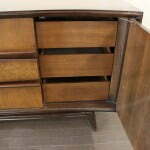 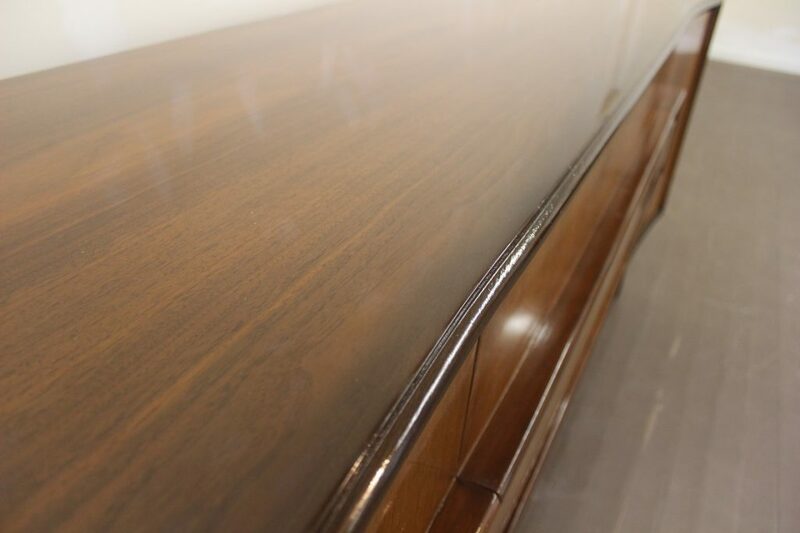 In addition to the wonderful burlwood detail of the pulls, the front of this credenza curves making the ends slightly deeper than the center. 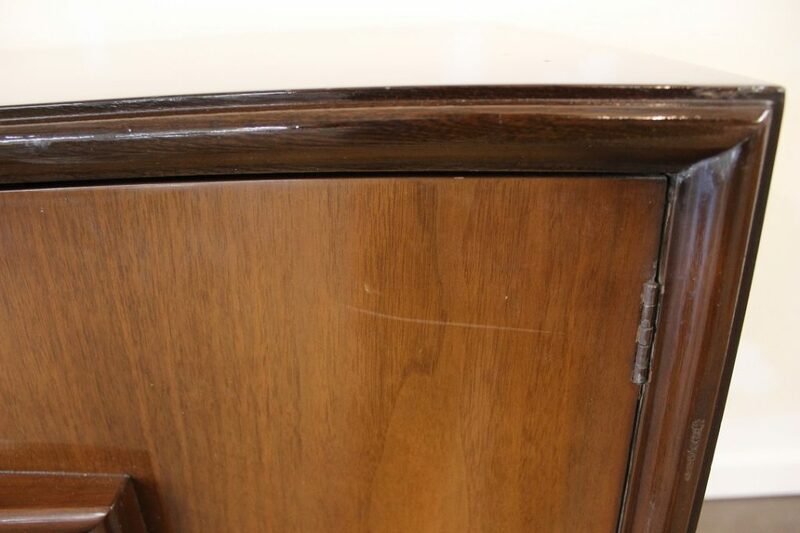 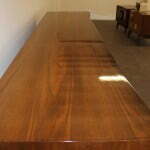 It is in great condition showing minor scratches on the top and small nicks on the legs and edges. 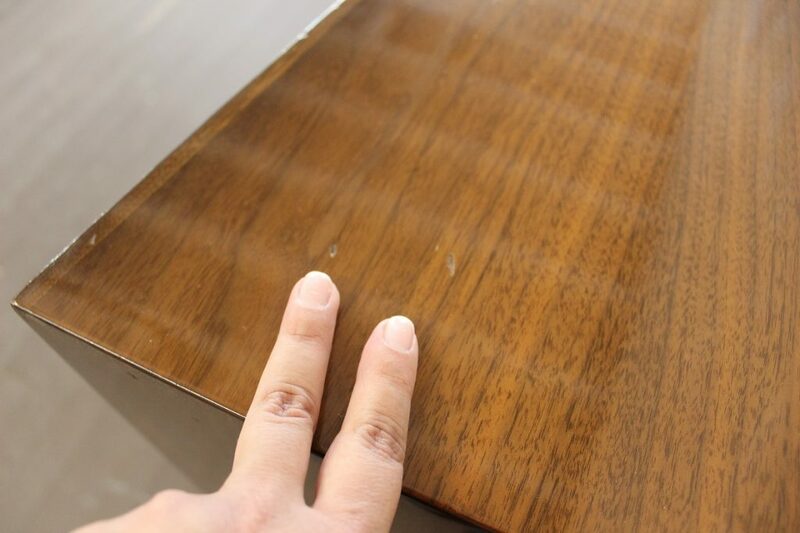 Clearly, the previous owners took good care of this piece. 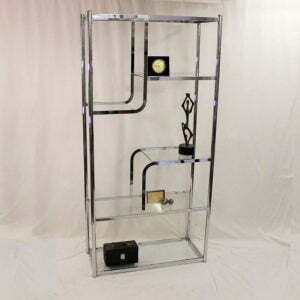 It can be the perfect addition to your home. 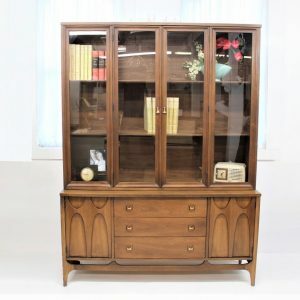 It offers a lot of storage space and wonderful looks to make it the statement of your collection. 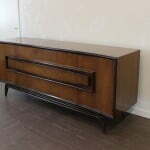 This amazing piece measures 80″ long, 21″ at the widest part, 19 1/2″ in the middle and 33″ high. 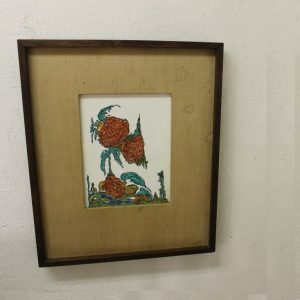 Here is a little bit of the history of the Hoke company; In the summer of 1946, Mr. and Mrs. Hoke (using their savings from 4-1/2 years in the Army) purchased at an auction from the estate of Mr. Leonard Waesche a small, 3-story building located at the corner of Maple Drive and Miller Alley. 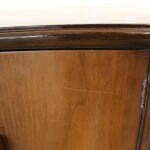 Initially, the product line would include juvenile furniture such as cribs and play yards. 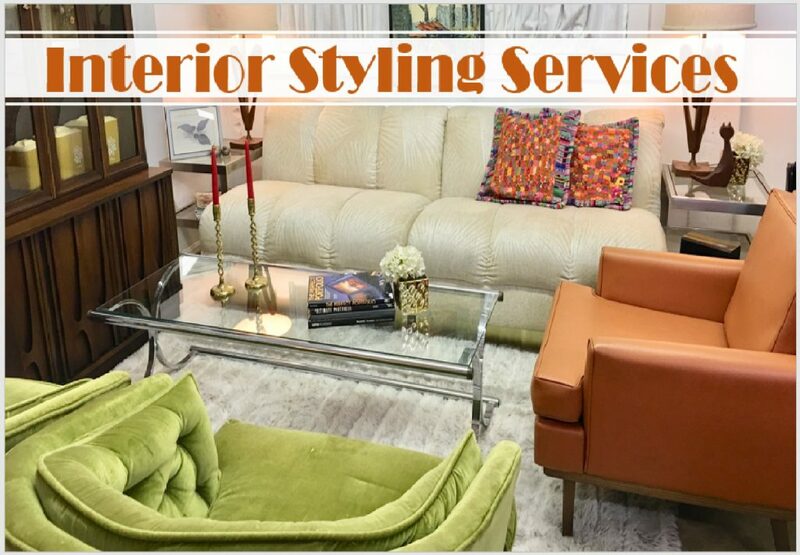 During the 1950’s and 1960’s, trends in the furniture industry leaned toward a new interest in decorative and ornate furniture styles. 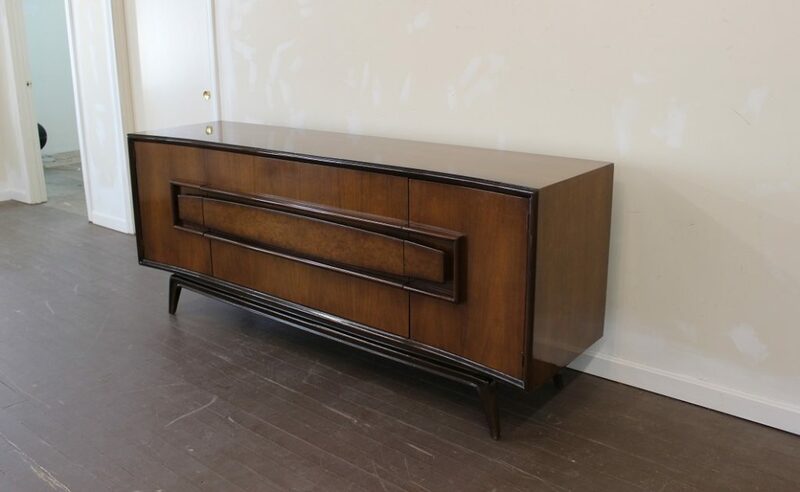 A fortuitous combination of designers, marketing professionals, suppliers, plant management, and skilled craftsman fell into place and The Hoke Furniture Company was off and running. 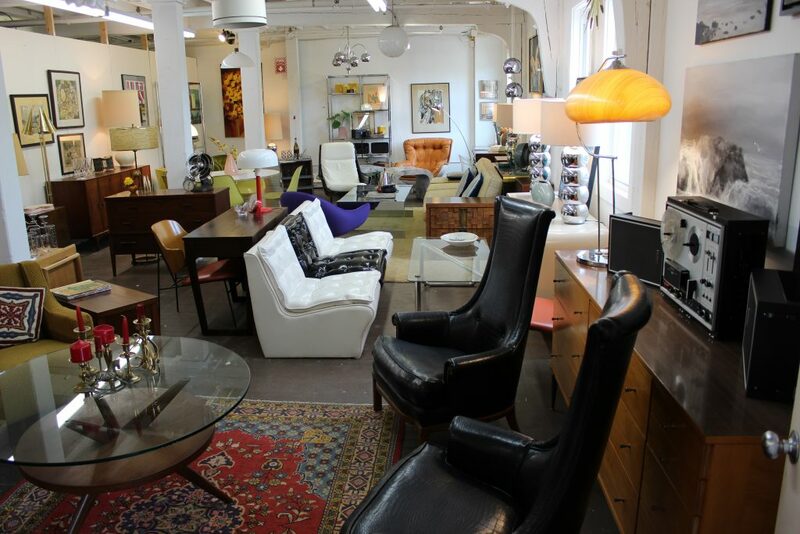 The manufacturing building burned in a fire in 1985.